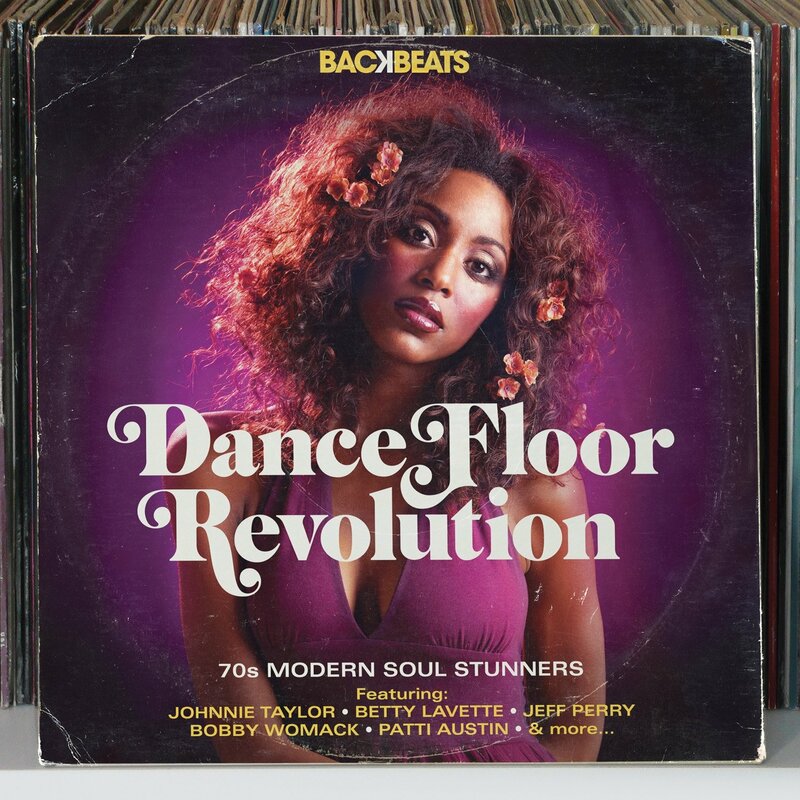 BACKBEATS-DANCE FLOOR REVOLUTION-70S MODERN SOUL STUNNERS. Over forty years ago, in the North of England a musical revolution was taking place in venues like the Wigan Casino, Cleethorpes Pier, Leeds Central, Stoke-On-Trent’s Torch and Samantha’s in Sheffield. Soon, Northern Soul became one of the biggest musical scenes. Not only was it thriving, but people from all over Britain, and further afield, wanted to experience this new musical movement. People came from far and wide to hear the music, dance, trade records and often, forged lifelong friendships. Mostly, the soundtrack was obscure soul records with a 4/4 beat. Often, these records had been released to indifference and the artists faded into obscurity. Now, these records were being revitalized, with these unknown recording artists becoming stars again. Suddenly, people wanted to know these artists and even better, were buying their music. Often, these singles were released in small quantities. So with demand outstripping supply, singles changed hands for huge amounts of money. Then between 1972 and 1974, two DJs decided to start changing the Northern Soul sound. By 1972, musical battle-lines were being drawn at the Blackpool Mecca. There, DJs Ian Levine and Colin Curtis, decided to start introducing songs with a more modern soul sound, which can be heard on the new Backbeats compilation Dance Floor Revolution, which will be released by Harmless Records on 25th March 2013. Many DJs and dancers welcomed this change of style. However, for many traditionalists, this was seen as an act of treason, the equivalent of a musical coup d’tat. With the benefit of hindsight, Ian and Colin’s introduction of Modern Soul was far from an act of treason. Instead, it was an attempt to ensure Northern Soul didn’t stagnate. Ian and Colin were passionate about music and were being realistic. Change had to happen. After all, if the same songs were constantly played, then eventually, Northern Soul might have stagnated and died. Ian and Colin had their supporters. There were also a legion of people opposed to their changes. Battle-lines were drawn. For their opponents, this was an act of sedition, revolution, not evolution. While Ian and Colin had their supporters, they had their opponents. People on both sides, voiced their opinions, often strongly. Northern Soul was split. Similarly, the introduction of early disco tracks divided opinion between Northern Soul diehards. Infighting gave way to collectively seeking a future vision for Northern Soul. The result was, friendships were fractured, and sadly, forty years later, many friendships have never recovered. This meant Northern Soul was weaker. Infighting rather than unity meant that other musical genres would overtake Northern Soul in popularity. All this infighting left the door ajar for disco, to create the UK’s next important dance-floor revolution. It could be argued that all this infighting weakened Northern Soul. Remarkably, the rivalry between Northern Soul traditionalists and those favoring Modern Soul has never recovered. The sad, and ironic thing about this is, that everyone involved had one thing in common…they loved Northern Soul. Where they differed, was in what the future held for Northern Soul. Now, forty-one years after the introduction of Modern Soul into the Northern Soul scene, the latest Backbeats compilation Dance Floor Revolution celebrates the Modern Soul sound, from 1972 onwards. Compiled by Harmless Records label manager Ian Dewhirst Dance Floor Revolution is crammed full of twenty-three musical gems. Whether you were for or against the introduction of the Modern Soul sound into the Northern Soul scene, you’ll realize that Dance Floor Revolution is laden with Modern Soul gems, when I tell you about the compilation’s highlights. Proving the importance of sequencing in a compilation, is the decision to place Earth, Wind and Fire’s Happy Feelin’ as the first track on Dance Floor Revolution. This was a track from their 1975 album That’s The Way of The World. It reached number one in the US Billboard 200 and US R&B Charts, resulting in the album being certified triple-platinum. After a few bars, you realize why. Straight away, this percussive driven track grabs your attention. Stabs of growling horns signal the arrival of Maurice White’s falsetto, while guitars and vibes drive the arrangement along. You’re enthralled by this stunning fusion of soul and funk. Having said that, you can’t help wonder what dancers at Northern Soul nights thought when this track dropped? The Brothers oft-sampled Are You Ready For This has a sound that would fit perfectly into a Northern Soul set. Released in 1974, on RCA Victor, this was a track from The Brothers’ Disco Soul album. Driven along by rasping horns and with swathes of the lushest dancing Philly strings, it’s a track that could’ve marked the future for Northern Soul. It’s not too modern, and would still appeal to traditionalists. David Ruffin and Eddie Kendricks’ I Couldn’t Believe This is the newest track on Dance Floor Revolution. It was released in 1987, on RCA Victor. Accompanied by blazing horns and crispy drums, which have a real eighties sound, the two Temptations spur on to greater heights. Quite simply, the interplay between David’s tenor and Eddie’s soaring falsetto is peerless. Soulful, emotive and this track swings along, leaving you wanting to hear much more of the two ex-Temptations. Bill Harris’ Am I Cold, Am I Hot was written, arranged and produced by Van McCoy. Released in 1975 on RCA, this was Bill’s sophomore single, and the followup to 1974s Uptown Saturday Night. Although this track benefits from Van’s assured production sound, it’s Bill’s heartfelt, impassioned delivery that steals the show. Sadly, Bill didn’t release any further music, and this track is tantalizing taste of an artist laden with talent. You can help but wonder why Bill didn’t enjoy a longer or more successful career? During his career, Lou Courtney was a member of Fifth Dimension and released three solo albums between 1967 and 1976. I’m In Need Of Love was his 1974 sophomore album. For anyone who hasn’t heard it, this must have album for anyone who loves their music soulful. The title-track, I’m In Need Of Love has a tough funky sound, with swathes of strings ushering in Lou’s powerful, needy and sassy vocal. He pleads and struts his way through this four minute epic. Gwen McCrae’s debut single was Lead Me On. It was released in 1970, on Columbia Records and was the start of a recording career lasting three decades. However, her career could’ve been very different, if she’d made the recording session for Rock Your Baby, which she was scheduled to record. When she was late, her husband George filled in, and the result was a career defining hit single. Despite this, Gwen enjoyed a long and successful career. This is apparent on Lead Me On, where Gwen unleashes a vocal tour de force. Emotion and power are combined as Gwen pleas, while cooing harmonies, piano and crystalline guitars accompany her. The result is one of the real highlights of Dancefloor Revolution. Sharon McMahan only released one single during her career. That was 1973s Get Out Of My Life, on Columbia Records. Produced by Toxey French and arranged by the legendary Bobby Martin, it doesn’t take long before you realize something special is unfolding. The orchestral arrangement, complete with swathes of lush strings is proof of this. Then when Sharon’s vocal enters, it stops you in your tracks. It’s tinged with frustration and regret, bringing the lyrics to life. Cooing harmonies sympathize with her plight, as her vocal grows in power and passion, delivering them with feeling and meaning. Given the talent Sharon displays on this standout track, you can’t help but wonder why we never heard much more her? The difference between a good compiler and a great compiler, is how deep they’re willing to dig. To find Betty LaVette’s You Made A Believer Out Of Me, compiler and Harmless Records label manager Ian Dewhirst has dug deep. Really deep. You Made A Believer Out Of Me was the B-side to Betty’s 1975 single Thank You For Loving Me. It has a jaunty, floaty string drenched, dramatic arrangement before Betty’s impassioned pleas enter. Harmonies sweep in, drums add drama and strings sweep and swirl. For her part, Betty delivers one of her trademark vocals, where emotion, sincerity and soulfulness become one. Ronnie Dyson released Lady In Red as a single in 1975, on Columbia Records. Like his 1973 album One Man Band, Lady In Red saw Ronnie undergo a Philly Soul makeover. Written by Vinnie Barrett and Norman Harris who arranged and produced the track for Baker, Harris, Young Productions. Accompanying Ronnie, were the classic lineup of M.F.S.B. It’s an uptempo dancer, with a real Philly Soul influence. Straight away, you can hear Norman Harris’ influence in the arrangement. Spurred on, Ronnie delivers a tender, hopeful vocal, against a backdrop cascading strings, cooing harmonies and confident rhythm section. While the result is a track that has Modern Soul written all over, it’s dance-floor friendly and laden with delicious hooks. My final choice is Bobby Womack Home Is Where Heart Is, which closes Dance Floor Revolution. This was the title-track from Bobby’s 1976 album, released on Columbia Records. Again, it’s an uptempo, dance-track. Here Bobby’s sassy vamp is accompanied by a driving rhythm section, gospel-tinged harmonies, piano and dancing strings. Later, the addition of rasping horns really lifts the track, as Bobby unleashes a grizzled vocal. The result is a vintage slice of soul, from a legend and survivor of soul music, that closes Dance Floor Revolution on a high. For Dance Floor Revolution, compiler Ian Dewhirst has selected twenty-three tracks that represent the perfect introduction to Modern Soul. This includes several tracks that Ian Levine and Colin Curtis played at the Blackpool Mecca. While Ian could’ve selected tracks “played at the Blackpool Mecca,” that’s been done before. So, he’s cast his net wider, and come up with a captivating compilation of some familiar tracks and hidden Modern Soul gems. He’s even chosen three quite recent tracks, including Damaris’ What About About My Life, David Ruffin and Eddie Kendricks’ I Couldn’t Believe. These tracks were released in 1983 and 1987 respectively. Many other compilers would’ve eschewed these of tracks, arguing that they’re “too modern.” To dispense with two quality slices of soul because they’re too modern, would’ve made Dance Floor Revolution a poorer compilation. Thankfully, Ian has stuck by the courage of his convictions. Add to these two tracks, contributions from Earth, Wind and Fire, Johnnie Taylor, David Ruffin and Eddie Kendricks, Lou Courtney, Patti Austin, Gwen McCrae, Betty Lavette, Ronnie Dyson and Bobby Womack and you’ll realize that from start to finish, Dance Floor Revolution is quality all the way. As an added bonus, there are hidden gems from Bill Harris and Sharon McMahan. When all this is combined, then Dance Floor Revolution, which will be released by Harmless on 25th March 2013 is the perfect introduction to Modern Soul. Forget the politics behind Modern Soul and enjoy the music on Dance Floor Revolution. After just one listen and you’ll realize why this music resulted in a Dance Floor Revolution. Standout Tracks: The Brothers Are You Ready, Lou Courtney I’m In Need Of Love, Sharon McMahan Get Out Of My Life and Ronnie Dyson Lady in Red.